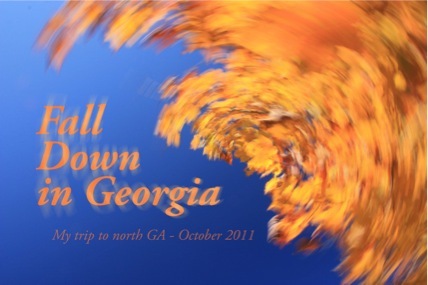 Every year, when the leaves start to change color, I remind myself that I need to get up to north Georgia before the Fall is over. This year was no exception, and last Thursday I decided to plan my adventure. I decided to try and catch the sunrise somewhere, and then get some pictures of the fall colors. My Friday started early, way too early. The first part of my trip involved beating the sun to the highest peak in Georgia, Brasstown Bald. I left a little before 5 and about 2 hours later I was in the parking lot at the base of the peak. It is about a 1/2 mile trail hike to the 4,784 feet above sea level overlook. I got my camera bag and tripod and headed toward the trail. When I got to the trail start, I was surprised by the “Caution : Ice” signs and yellow rope everywhere. I strategically found a way around the ropes and made my way to the trail. Ironically, I slipped on some ice when doing so, haha! As I made my way up the trail to the top, I began to realize a couple things. One: “It’s really cold...........in fact.........was that snow on the ground? yes.......oh my!” - Apparently it had snowed quite a bit the day before. Finally I made it to the top of the peak, and to the overlook patio. The patio was covered in snow with up to 2 or 3 inches in the corners. I had made it in plenty of time before the sun hit the horizon, but I could already tell that the conditions would not be very good. In just the 1/2 mile hike from the parking lot, there was a lot of cloud cover and wind. Not great for getting a sunrise shot. I made my way to the eastern overlook on the patio and setup my camera. After my heart rate slowed from my race up the mountain, I soon realized that it was stinkin’ cold up here. I had 6 layers, and the bitter cold was still getting through. I was glad that I had grabbed my gloves as I left the house, but they only helped a little. And it’s really hard to take pictures with frozen phalanges. I called my camera all sorts of bad words as I tried to hit the the shutter button with my ice-cubed fist. hahah! Really though, the view was amazing and no picture could do it justice. I always think of Psalm 50:1 when I see a sunrise, and know that these are the sights the author was writing about. Above is a timelapse video of the sunrise from Brasstown Bald's Eastern overlook. It is about 90 minutes compressed to 2 minutes. Click to view on YouTube to see in 720 HD. I was able to get a few decent pictures, but not what I was hoping for. I also took my pocket vid cam and was able to get the sunrise on video. When the sun had fully lit the land, I could really see the beauty. From the overlook patio you can see out very far in every direction. The fall colors were apparent no matter which way you looked and the trees near the overlook were still covered in ice. Really a beautiful sight to see. I stayed up there for about 2 hours enjoying the scenery and snapping pics. 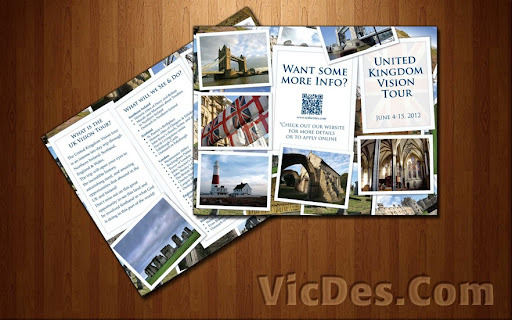 Personally, designing brochures is one of the most difficult items that I work with. There are several reasons for this, but I guess the main one is that you often have to focus most of your time on text structure and layout. When this happens, the creativity portion tends to fly out the window. Well, I just kinda rediscovered a way to creatively approach a brochure design and thought I would share the story. If your stuck with a boring layout, you only need one special ingredient - PICTURES! Everyone has heard the phrase, “A picture is worth a thousand words”. I recently had a couple projects where those words rang out in my mind, and I am so glad they did. 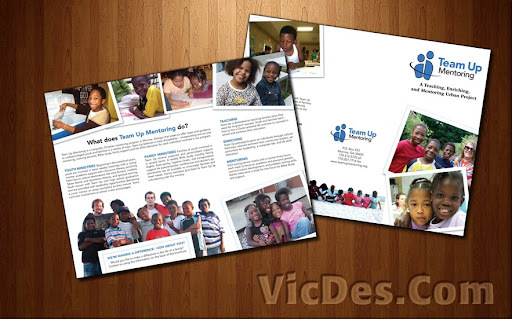 When I was asked to do a brochure for Team Up Mentoring in Monroe, GA I was not really sure which direction to go. At first I was just going to update the current design that they had with new pictures and a fresh look. However, when the director gave me tons of spectacular pictures to choose from, I knew I really needed to focus on these. The purpose of the brochure was to help create interest in their program and these pictures would be perfect for that. Really all I needed was a layout that “let the pictures do the talking”. I remembered a picture frame idea I had used several years ago on a flyer, and decided to give it a try. With the abundance of great pictures, I think the Team Up Mentoring brochure design was a success. What’s funny is just last week I had another brochure design request. A friend of mine, Chris Waye, is helping set up a missions trip called the “UK Vision Tour”. He needed an informative brochure to hand out to those that might be interested in a trip to England, Ireland, Scotland, and Wales. Your probably thinking what I was thinking! What better way to convince someone to go to the these special places than with some awesome pictures! Once again, I was able to get my hands on some spectacular images to use in the brochure. And what better way is there to get folks signed up for a “UK Vision Tour” than to simply let the pictures do the talking. So remember, next time you’ve got a project where words just won’t do the job - let your pictures do all of the talking! If you would like more information about these click the pics or the links below.